North Allegheny administrators see closing Peebles Elementary School as inevitable in a district with stable enrollment and excess classrooms in an era when public schools are facing serious financial difficulties. On the other hand, members of a citizens group fighting the proposed closure see a future with overcrowded schools and higher class sizes. And they dispute the administration’s enrollment projections. In the middle of both sides is the school board — a majority of whom live in McCandless where Peebles is located. The school board will hold a public hearing Wednesday on the proposed school closing, which would occur next year. The board cannot vote on the recommendation until at least three months after the hearing. The process began two years ago when Architectural Innovations, which was contracted to perform a comprehensive analysis of all 12 buildings, recommended closing Bradford Woods Elementary, contending that the school needs $14 million in renovations, and Peebles. The report said there would be sufficient capacity in the remaining five schools to house all elementary students. But administrators and board members were skeptical of the firm’s numbers and recommendations, and commissioned a second study — this one by Thomas and Williamson, a construction management firm that previously did work for North Allegheny, but was involved with a lawsuit that led to a $500,000 judgment against the district. Thomas and Williamson reduced the estimate of repairs at Bradford Woods to $8.3 million, and recommended closing Peebles instead. Administrators agreed, making the recommendation in November. This isn’t the first time a consultant recommended closing Peebles, the district’s oldest elementary school. It also was recommended in 1997. 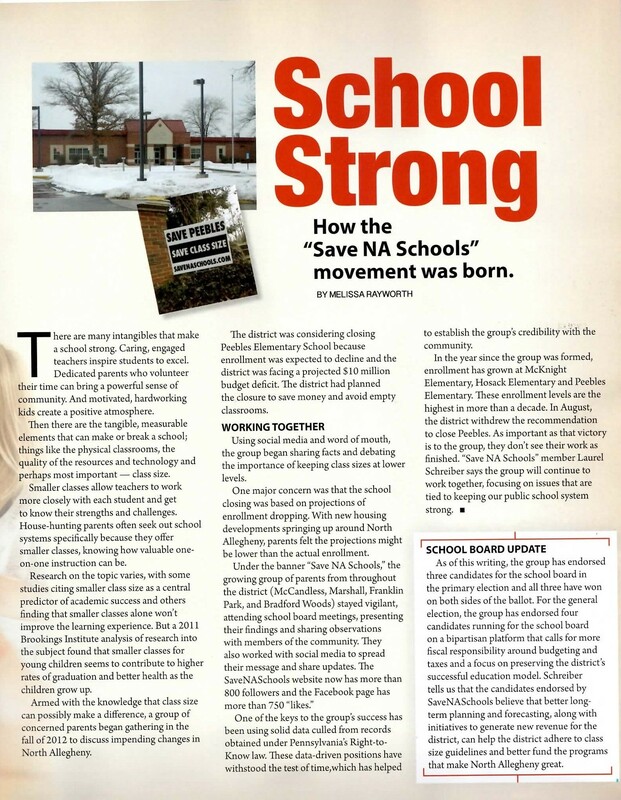 But Laurel Schreiber and Tara Fisher, leaders in the Save NA Schools group, said that 1997 recommendation also included expanding McKnight Elementary to hold 1,500 students, and possibly adding onto Hosack Elementary. Both schools are also in McCandless. “It is not a parallel set of facts,” Mrs. Fisher said. Projecting enrollment is not an exact science. This year, enrollment was up 89 students districtwide and the 8,215 students enrolled on the third day exceeded the projections in last year’s demographics and feasibility study. But Mrs. Fisher said the administration has underestimated enrollment for the past 13 years. The citizens group took the district’s five-year enrollment projections in 1999, 2006, 2007 and 2008, and compared them with third-day enrollment figures. Each time, enrollment was higher than the district had projected five years earlier. Administrators chose Peebles over Bradford Woods for closure in part because the most growth is expected in the northern half of the district as those municipalities, particularly Franklin Park and Marshall, expand with public utilities. Brian Miller, assistant superintendent for K-12 education, said that, for every 10 babies born in Franklin Park, 12 kindergarteners show up in school. In other areas, 10 babies are born, but only eight children are still living in the district by kindergarten. The citizens group contends that enrollment also will increase in McCandless as the older homes of empty-nesters are sold to young families. Because enrollment is stable, the district has excess classrooms at the elementary level, administrators say. Closing a small elementary school such as Peebles will allow them to better distribute students and lower class sizes. Save NA Schools disputes that on its website, outlining a scenario of what the district would look like if Peebles had closed this year. The number of sections would have increased, and class size would hover around the maximum in nearly every section, Mrs. Fisher said. Closing a small elementary school and redistributing students allows the district “the ability to be more operationally efficient,” Mr. Miller said. And that is important as the state cuts education subsidies and increases unfunded mandates, charter school tuition eats a large portion of the district’s budget and retirement costs increase by double-digit percentages every year. North Allegheny is facing a $5.7 million deficit for 2013-14. During the past two years, the district reduced 90 positions through an early retirement incentive program, initiated activity fees for students, increased parking fees, accepted advertising on its website and in facilities, and is seeking sponsors for naming rights. But the district needs to continue to search for ways to maximize efficiency, administrators say. The district has estimated an annual savings of $850,000 by closing Peebles. More savings will be realized if the facility can be rented, they say. “In challenging fiscal times, that’s the way that you need to run an organization. That’s the way a family needs to run their household. That’s the way a private enterprise needs to run their company,” Mr. Miller said. Mrs. Fisher said the savings does not justify the turmoil in which closing Peebles will leave students. “Where is the priority for the district? This is a proposal that will save less than 1 percent of the district’s operating budget, but the impact will affect every student and every teacher at the elementary school level,” she said. Sandy Trozzo, freelance writer: suburbanliving@post-gazette.com. • School buildings are under-utilized. There are the same number of spare classrooms as in 1997 when a community task force recommended closing Espe and Peebles schools. • Closing a small elementary school will better equalize class sizes throughout the remaining schools. • Projections show the district’s enrollment remaining stable. • On the Web: www.northallegheny.org. • If Peebles is closed, the remaining six schools will see an increase in class size and an increase in sections, which eliminates the spare classrooms and makes it harder to manage class sizes. Seventeen classes would have 29 students or more. • Other school districts have lower class sizes, especially in third grade. North Allegheny’s guidelines call for 30 students or fewer in grades three through five. The average third-grade class is 21 students in Pine-Richland, 21 in Mt. Lebanon and 24 in Hampton. • The administration has underestimated projections for 13 years. Board members have questioned projections both from the administration and in the Phase 1 report.